Please join the fun, exciting, life-affirming, environment benefiting, life-creating campaign for carbon dioxide! Within 50 years, in the time of our children and grand-children, we will have improved the environment and created a lush, green, productive, life-filled planet Earth with all of the beneficial green plant food carbon dioxide we are re-adding and giving back to the environment. The carbon that is currently trapped in hydrocarbon fuels used to be life! It used to be carbon circulating in the global biospheric process of life, and sustained a lush, green planet, that could support huge creatures like dinosaurs in the past. Today, that carbon-based life has been trapped underground and has formed hydrocarbon fuels that humans can access. Humans get to use that old carbon, which has turned into hydrocarbon fuel, for benefiting our standard of life and relieving poverty on a global scale, and enriching human livelihood in general with the energy it provides. That hydrocarbon fuel has supported a tremendous and enriching transformation and development of human society in the last hundred years. For the last few millions years, the carbon dioxide concentration in the air was getting so low that plant life was almost ready to stop being able to perform photosynthesis! This would have spelled the extinction of almost all life on the planet, and this extinction would have been global and possibly permanent! It was a very close call. Luckily, by the grace of God, evolution, Gaia, or whatever you would like to believe – even convenient and lucky happenstance – humans came along at just the right geological time-period to return that trapped life, carbon, back into the atmosphere as carbon dioxide where it can then turn back into plants and sustain new and more life. Isn’t it amazing? It is the most wonderful win-win situation that nature could have provided for us. We get cheap, beneficial, life-enriching energy, and the environment gets back its own source of fuel. It is exactly like how animals and humans breathe out carbon dioxide, and then plants turn around and breathe it in as food, and then produce oxygen for us to breath again. The circle of life. Except now, we’ve industrialized that process and are returning much more food back to the environment where it is supposed to be, and where it can do some good in creating new life. We’re giving back the breathe of life by using hydrocarbons and giving carbon dioxide back to the atmosphere, and this new carbon dioxide can now go back into real, living life, in the present and future. We can use this wealth supplied by hydrocarbons and the time it gives us to develop new, future-oriented sources of power such as advanced nuclear, fusion, and whatever power generation technology science might invent, because eventually hydrocarbon fuels may become too limited to provide the energy requirements we desire. And when we get to that point, we will be able to always look back and think of all the good that we did for the environment by reinvigorating it with its own carbon dioxide – carbon that had been trapped away from its use in creating and being life. Please help spread the word of this fantastic news and fantastic science! Gallery | This entry was posted in Carbon Positive Campaign and tagged campaign for carbon dioxide, carbon dioxide, carbon energy, carbon positive, Carbon Positive Campaign, hydrocarbons, plant food. Bookmark the permalink. 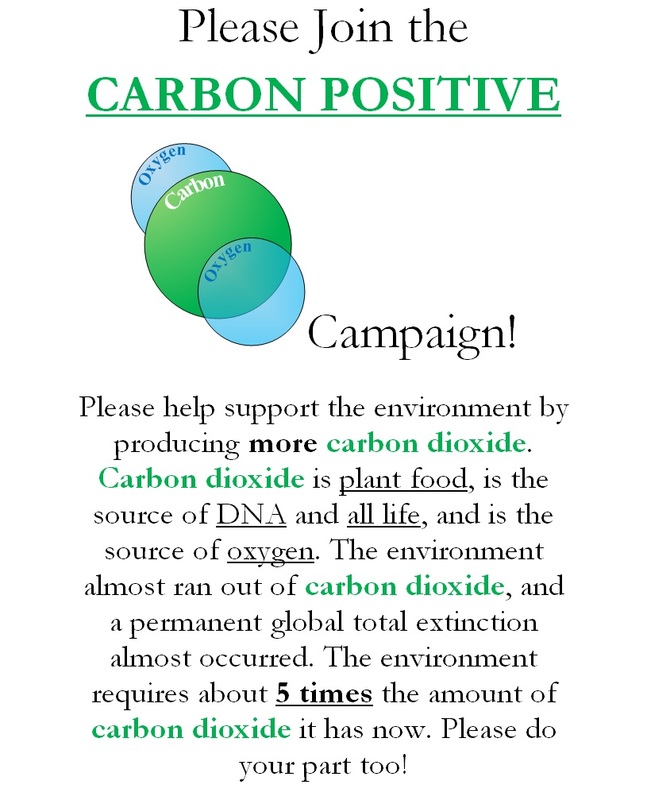 56 Responses to Carbon Positive Campaign! Where do I sign up Joe? Well the idea just popped into my head yesterday. I thought – why the heck NOT tell the truth? Tell the truth as it actually is. Hence I was reminded of the Orwell quote. This will bring the cognitive dissonance of the alarmists right to their face, and they may have mental breakdowns at the message. To sign up, print and post the images somewhere at the bottom of the post, or send an email link or “share” to anyone you can. Here is an article I wrote on the same theme. I made a presentation in Austin Texas on Monday and included some of these themes with additional quotes. The Club of Rome expanded Malthus’ simplistic linear projections to all resources. If the present growth trends in world population, industrialization, pollution, food production, and resource depletion continue unchanged, the limits to growth on this planet will be reached sometime within the next 100 years. In 1994 they reported what actions were necessary to deal with the problem of humans. In 1974 the Club of Rome wrote “the earth has cancer and the cancer is Man.” Their solution is to get rid of people. A major player in this plan was John Holdren, Obama’s science tzar. Here is one web site that reports on his writings and activities. In his confirmation hearings he claimed he didn’t believe in any of those positions any more. Ironically, if overpopulation is a problem the best way to reduce to is through development. This was established with something called the demographic transition that I wrote about here (with diagram). More recently I posted this article showing how the debate is an extension of the Rousseau and Voltaire debate. A new front…CO2 is good and very necessary! Excellent idea. It highlights the need for the other two fronts; AGW is nonsense , and the UN-IPCC is a fraud creating it’s own climate ‘science’ to support it’s political objectives. I look forward to the day when this compendium blows away this sorry chapter of modern Lysenkoism. The reality is that humans are a wonderful species, part of and protective of the natural environment. Agreed Peter! I don’t know what is infecting society…well, I do actually, because Tim Ball gave the source material for it all…but I wish people would wake up and start valuing themselves! It is disappointing that people can so easily be tricked into devaluing humanity. 1 Malthus…technology growth is linear, population growth is exponential…therefore the elite MUST periodically CULL THE HERD…. 2 Darwin…only the fittest survive…since the elite are the “financially fittest” due to their ability to LIE, STEAL AND KILL….therefore, the oligarchy should direct all human life and planet resources…. 3 Nihilism….there is NO basis for value judgements for “good or bad”….therefore WE can dismiss any value system that limits OUR lying, stealing and killing…[destroy religion]…. They have successfully incorporated these malignant precepts into their corporate mind control matrix….the question….how long can this malignant mind set remain in power, once exposed? Certainly, humanity is approaching the end of this feudal, imperialistic, demonic control network’s tyranny…. That is a good summary. In terms of atmospheric concentration. The current value is about 400ppmv and it would be best to get it to ~2000ppmv. Yes, I understand what you’re saying, I’m interested in your justification for saying it. Why is 2000ppm “required”, or why would it “be best”? Given that this is the level typically used in greenhouses to optimize plant growth, and the charts and scientific data which say this is a good target. It could easily be higher, say, 3000ppmv or 4000ppmv, but, 2000ppmv is an easier target to reach and “5-times” is a nice intuitive number. So it’s desirable for plants in greenhouses, but what’s to say it’s good for the rest of the ecosystem? This planet hasn’t seen levels like that since the mid-Cretaceous, does it not make sense that the current biosphere is adapted to the current levels? Ice, plants inside greenhouses today are not plants from the Cretaceous; by definition they are plants from the present. Plants from the current ecosystem benefit when they have more CO2. CO2 is their food. “Current adaptation” does not equate to “optimally-life-producing”. An adaptation can take the form of a very poor expression of life, given resource restrictions; in a more resource abundant environment, a new “adaptation” can be found which is more life-producing and beneficial to life. Plants in a greenhouse are not “the environment” either. The argument that it yields some positive outcomes in one tiny isolated system, therefore the environment requires that much CO2 is not really a logical leap. “Beneficial to life” and “optimal for life” are also both entirely subjective. When told about the practice of increasing the CO2 concentration in greenhouses, to increase production, alarmists probably think that this extra CO2 will save on heating energy for said greenhouse due to the GHE within. Some hope, nonexistent science. Yah, and very interesting isn’t it John that CO2 does NOT save on heating inside a real greenhouse! If it wasn’t for the billions of dollars they have in propaganda marketing, none of this fraud would have ever gotten off the ground. But that is a telling and important thing to consider, what can be lied about if you have the money and control of media. The more the merrier, Joe. Over the last 8 years or so, I have been regularly visiting at least two sites that have been labouring in this direction : http://www.co2science.org ; http://carbon-sense.com. (because I have always been convinced that the nub of the problem is demonisation of CO2). Why not combine forces? Great idea…not sure I’ve spent any time at either of those sites. I’ll check them out and contact them. Cheers. What a great idea, Joe. Thank you Viv. That is an excellent report! Cheers. We are carbon life forms, carbon dioxide is not just plant food, it is the basic foodstuff of all of us; we’re around 20% carbon. There is not enough carbon dioxide in the air for us to breathe oxygen efficiently so we provide our own for every breath in, 6% in each lungful. We breath out 4% carbon dioxide. Don’t know if an atmospheric CO2 level of 2000ppm is even possible again. There is way too much buried carbon that will be very hard to release back to where it belongs. Certainly, levels of 280-500ppm are very much right at the bottom end of plant requirements, near starvation levels ! Also certainly , there is absolutely no requirement to limit CO2 emmissions into the atmosphere, Limiting CO2 emmissions is actually counter-productive, as they are ALL totally beneficial to the biosphere and therefore life in general. The so-called back radiation warming is a total fabrication to try to link CO2 to warming so as to control the world wide agenda. It does not exist. CO2 does not warm the atmosphere in any way shape or form. ps, I have had thoughts of a “beyond 700ppm” CO2 site, just to stick it up the left nostril of people like McKibben and his 350.org fools. Yes that is a great idea too! This is an experiment that I did on the effect of carbon enrichment on barley grass by just exhaling several times daily into the enclosure where it was growing. A CO2 meter within the enclosue read about 1350 ppm. As you can see the carbon enriched grass was 50% larger after about one week’s growth. It is one thing to talk about the fact that carbon dioxide is plant food, but when one sees it happen in front of one’s eyes it leaves a lasting impression. What a marvel this life-giving gas is! If elementary schools were doing carbon enrichment experiments like this instead of those inane “greenhouse effect in a bottle” experiments I would be more up beat about humanity’s immediate future. As it is children all over the world are being taught that when they exhale they are breathing out a poisonous gas that is causing hurricanes, droughts, floods, tornados, and causing inhabited islands to sink into the sea! Imagine that, as we politely discuss the beneficial affects of carbon dioxide on the biosphere children everywhere are being taught to feel guilt just because they are breathing! Surely it amounts to some form of psychological child abuse. Wow great stuff Carl, I didn’t know about this. Excellent work! Awesome that you’re a juicer too! Brilliant idea. 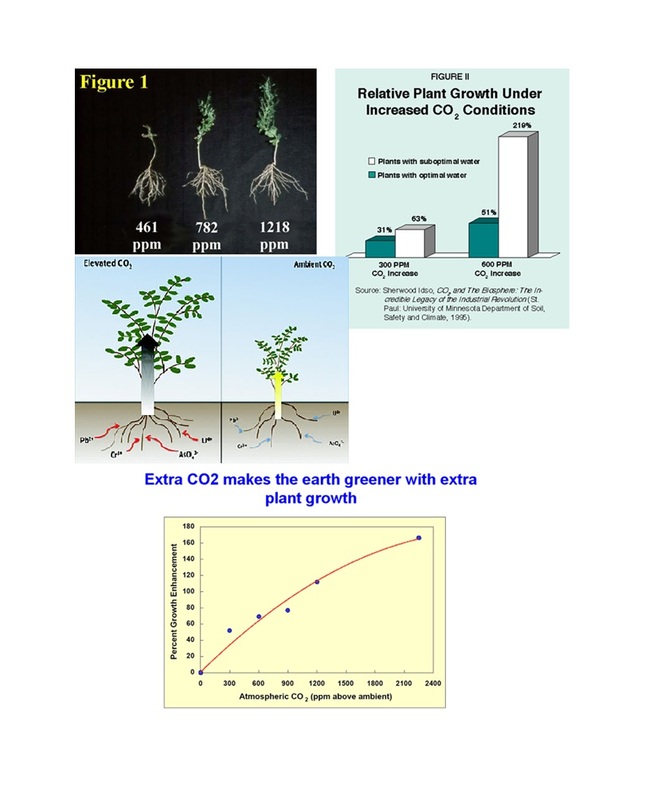 The facts of CO2 are not well known by the general public, I guess they don’t teach it in school anymore (I know of one person who thought it was a lie that CO2 is used in green houses and that it is plant food). Too many just believe the myths and the lies. This is a great site to direct them to, to get facts and look at the science. Thanks Mr. Everard! Yes they are totally destroying the education of youth…quite on purpose. It is very worrisome because they are implementing a change that will happen when our children reach voting age…they will have been brain washed and know absolutely nothing about the truth of the climate. Is that sci-fi writing you do at your site there? Looking forward to reading it! I have downloaded Robertson’s paper and think it very well sums up our views. But one nitpick I have whenever the subject of CO2 is broached is the insistence on calling it “plant food”. It isn’t, is it? any more than oxygen is “animal food”. Obviously it is an essential component of our metabolism and we couldn’t survive without it, but at the same time we can’t live on thin air. We need nutrients, as do plants. CO2 is an essential component of photosynthesis as is sunlight, but do either constitute “food”? I think it’s very important right from the start to properly define our terms. Yes that is a good point, I too was thinking about the term “food”, but I used it because I’ve seen it elsewhere. But you are very right in that the sophist BS’ers would take the opportunity to try pretend I made some big mistake in calling it “food”, when, it should be perfectly obvious what is meant by the statement. Now that you’ve pointed it out though we can be on the offensive and be ready for that type of BS, when it comes we can point out how ridiculous and pathetic such a criticism is. Photosynthesis is obviously the “going concern” in terms of plant life. Yes nutrients are taken up in the soil but this is in service of the photosynthesis occurring above which creates the actual energy and creates the new plant material and growth. Plant’s don’t “eat” in the way an animal does (with the exception of a few types of plants), but in terms of a general analogy the term “CO2 is plant food” is similar to the fact that Sunlight is also “plant food”. Sunlight and carbon dioxide are the fundamental components of plant life, and all life. Plants can not live without both of those present, and they are the fundamental “food” for the plant, along with the nutrients which are taken up too. It is interesting that so-called environmentalists want to take away sunlight and use it for electricity, for making toast and playing video games etc., and they also want to reduce CO2. It is almost as if they hate plants! Simply because both oxygen and carbon dioxide are gases does not mean that their function in the metabolism of animals and plants respectively is identical. In animals oxygen combines with carbohydrates preferentially to produce the energy that powers animal metabolism. In animals proteins are seen as food since they break down into the amino acids that are the building blocks of new proteins that both form and maintain the structure of the animal body. In plants its different. Plants do not “burn” carbon dioxide for energy. The energy that powers plant metabolism is sunlight. Carbon dioxide is to plants as protein is to animals in that carbon dioxide is a central building block of not only the cellulose that makes up the bulk of the uneatable parts of a plant, but also is a central building block of the carbohydrate, which is the eatable port of the plant. Therefore, since carbon dioxide is, by definition, food for plants I will continue calling it what it is. Confirmation in the sense that CO2 can not be responsible for this upper atmosphere night side heating. If it is not responsible for that, why is there any reason to think it is responsible for the temperature at the surface when the mechanism above would naturally result in the surface being isothermal? Max, could it be possible that CO2 is responsible, not because of some imagined back-radiation, but that high concentrations of CO2 provide for much faster radiant heat transfer in the atmosphere because of its absorbtion and release of energy. Why can’t people grasp that CO2 is the basis of all of the hydrocarbons that plants produce and become complex carbohydrates including all sugars, proteins, enzymes and every constituent of plant and animal physiology ?? Without it and the photosynthesis of the plant kingdom there would be no life – period. Amazing the lengths liars go to make good data look bad! lol!!! And it is not just increased temperatures or rainfall, but due to increased CO2. Yes definitely…CO2 is plant food and we came at just the right time to bump it back up to healthier levels. The only thing we need to ensure is to prevent another ice age. How could we prevent another ice age? If the forces are too large, we might not be able to. However, there are some obvious things – create more heat at the surface. Putting charcoal on snow would melt snow very fast. Use darker pavement and concrete in cities and roadways and darker rooftops…anything to increase radiant absorption at the surface. Whether modification. Irrigate and green the deserts, make them darker with plant life, and holding more moisture, they will hold more heat overnight than they do now, etc. But if cloud-cover takes over from too much cosmic ray flux from too quiet of Sun or something, maybe we wouldn’t be able to stop it. Anyway, geoengineering. Reblogged this on Millennia Blog. I believe the situation is far far worse than hiding the truth about climate. In order to lie to children about CAGW, teachers are (probably unknowingly) complicit in stunting the learning process since to lie about climate requires children to be discouraged from inquiring about basic scientific issues like the laws of thermodynamics, the carbon cycle etc etc. On its own this is bad enough, but by stunting their scientific development in this one area, they are also severely impacting scientific enquiry in many other areas. This has being going on long enough now that we have teachers brought up this way such that the cycle not only repeats but is amplified for each generation. I have otherwise very bright children that cannot seem to understand what I am talking about when I try to explain these problems. Poor old dad “going off on one again!”. For the record, my road to scepticism of CAGW followed a similar path to your own and many others here. It’s just total brainwashing…so sad.